From Tamashii Nations. One! Two! Three! Go! 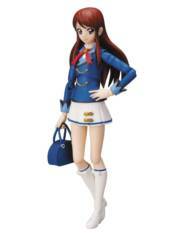 The third member of the S.H.Figuarts Aikatsu line-up is here! Introducing the coolly stylish Ran Shibuki in her adorable winter uniform! Ran comes with tons of adorable accessories to help her on her way to becoming an idol. She also comes with special interchangeable hand parts that can be used to pose the three friends holding hands together. Accessories include 3 interchangeable face parts, 8 interchangeable hands, 2 pairs of special interchangeable hand parts for holding hands, school bag, 2 Aikatsu Phones, 4 mini Aikatsu! Cards, school ID, and display stand. Stands approximately 5 1/4' tall.